It's always a pleasure to welcome Jenn McKinlay, author and fellow librarian, to the Velma Teague Library for Authors @ The Teague. And, this time, she even brought me a present, the ARC of the July release of Red Velvet Revenge, the fourth book in her Cupcake Bakery mystery series. This creative author is currently writing books for four series! Jenn was a familiar face to many in the audience, so they jumped in immediately to ask questions. Which series does she prefer? Right now, it's the one she's working on, a London Hat Shop mystery series. The first in that will come out sometime in 2013. Jenn loves hats, and was all caught up in the royal wedding. In fact, halfway to Velma Teague, she was thinking about the book, and knew one of her characters wouldn't act that way, so she pulled over, and changed her character's action. She said she still takes notes the old-fashioned way. Her husband, though, is a techie, married to his e-reader. She's his second wife now. With the London Hat series, Jenn will have written five series. The character in that series is 27, while the women of the Good Buy Girls in her Bargain Hunters series are in their forties. Jenn McKinlay is a true storyteller who loves humor, so she said she had a funny story to tell us about the Tucson Festival of Books. She was in the hospitality lounge with authors Avery Aames and Kate Carlisle, who are friends. The three of them are going to Malice Domestic together, then a mystery conference, and then to Cozy Con at the Phoenix main library, Burton Barr. She said they'll be sick of each other. Anyways, I joined the three of them, telling them I had just come from Kevin Hearne's panel. Jenn asked who he was, and I explained he was a fantasy author from the Valley, who wrote the Iron Druid Chronicles. Jenn was interested because he's local, and she tries to keep up with the local authors. Avery, Kate and I left for our panel, and Jenn pulled out her computer to work since she writes ten pages a day. (That's how she keeps four series going.) Then, T. Jefferson Parker sat at the table next to her. She said she's a complete geek who worships everyone. While she was talking to him, two guys sat at her table, and completely ignored her when she sat down again. So, she ignored them. And, she couldn't see their badges, so didn't know who they were. When James Owen came over, one of them got up and shook hands with him. Afterward, Jenn said, he's really nice. And, Sam Sykes said, yes, he blurbed my first book. Sam writes sword and sorcerer books. The other author introduced himself as Kevin Hearne. So, they started talking, discovering they all live in the Valley and they all have the same sense of humor. Then, some crazy-looking woman who appeared to be about 110 years old, with her hair in braids, came up to the table, and said, I can make you famous, as famous as Casey Anthony. Sam asked, "Do I have to kill someone?" And, she answered, "It would help." As soon as she could, Jenn escaped, saying she had to go to a panel. Then, she started getting texts from Sam and Kevin. "Can't believe you ditched us." Jenn's husband, when he heard the story, said, "So, in other words, if you were Ron, Harry and Hermione in the bathroom fighting trolls, you ditched." That wasn't the end of the story. The next day, Jenn and Kate Carlisle were to sign at the Poisoned Pen's booth. Kate was all excited because Diana Gabaldon was signing just before them. Jenn said she had met Diana, but she wouldn't know her. When they arrived at the booth, Gabaldon was signing, alongside Sam Sykes. Sam saw Jenn, and said, "YOU! You ditched me with a Gollum!" And, Diana Gabaldon turned around and said, "You ditched my son with a Gollum?" Jenn said, well, Diana Gabaldon knows who she is now. Then, McKinlay said she recommends that anyone who loves books attend the Tucson Book Festival. After just four years, it's considered one of the best festivals in the country. Asked about writing, Jenn said she used to write romances, but she wasn't any good at it. She kills people better than she writes love scenes. She originally went into romances because she thought it was a good way to break in. However, she discovered it's hard to write romance. You have to be good at it. Jenn found out that she has to have a dead body in her books. McKinlay found an agent who liked the mysteries she submitted, but she couldn't sell them. Then, she said Berkley Prime Crime wanted someone to write a decoupage series. She said she'd write decoupage. The series didn't do well, but they liked her. And, she knew these mysteries were her window. She's the one who submitted the idea for the Cupcake Bakery series. They liked that, and they liked her idea for her library lovers' series. You have to find your way in to writing with a publisher. McKinlay is writing under the name Josie Belle for The Bargain Hunter series. Her agent said Berkley was looking for someone to write about bargain hunters. Jenn said she's a bargain hunter, and she could write it. But, maybe she is taking on too much now, writing four series at once. Avery Aames said they had been taking bets on how long it would take for Jenn to realize that. Jenn said she thought the trend for cupcakes would be over by now. She was paranoid the Cupcake Bakery series would end. But, she's contracted now for eight books in series, and six in the Library Lovers' series. In response to a question, she said the library series is the hardest to write. She knew nothing about cupcakes, other than she likes to eat them. She toured kitchens and looked in refrigerators. When she was looking in refrigerators, the people in the bakeries said, "Oh, yeah, you're a writer." She had no preconceived ideas about the bakeries. But, as a librarian, she knows too much about the library business. That could be the most boring series ever if she put in too much information about policies, local government, and how libraries operate. Jenn's books cover a number of age groups. She's fond of the women in the cupcake books. They're in their 30s. The forthcoming London Hat Shop series features women in their 20s. And, there are women in their 40s in the bargain hunters books. That's a fun series to write. In the past, she's known about the locations covered. The decoupage books were set in New England where she grew up. The cupcake one is set in Scottsdale. The library mysteries are set in Connecticut, where Jenn lived and went to school. She's never been to London, though, the setting of the next series. But, Google Earth is wonderful. She can see Portobello Road and the shops. She can see the roads, and how long it would take to get somewhere. McKinlay's greatest fear is that she'll write something that the entire country of England would hate her for writing. She's even planning to ask a friend here in Arizona if she can use his pub as the British setting so it's a pub everyone in the country doesn't know. She came up with the idea for this series when she watched the royal wedding. She was obsessed with the hats. And, how do they keep those fascinators on their heads? Asked about the books she writes under another name, she said those names belong to the publishing company. She has the copyright for the books written under her own name. Some other mystery writers, such as Lorna Barrett, do the same thing. They write books for the company under pseudonyms, and others under their own names. That's how some slid in the back door to writing under their own names. Since there were a number of questions about writing, Jenn warned that she's self-employed, and she pays lots of taxes. You get checks for signing a contract, delivery of the manuscript, and a check when the book is published. Then you'll get royalty checks. Her trip to London will be deductible, but she sees she only gets forty-some dollars a day for food, and she knows she's going to eat more than that. Unfortunately, she can't write off taking her kids, and she thinks it's a good opportunity to take them. She had hoped to go during the summer, but the Olympics are in London this summer. So, they'll have to work around school breaks. Why does she write so many series? Is it that she's driven, lucky, or likes money? Jenn answered that she writes ten pages a day for all of the above. She's a book nerd. Her mother was a librarian. Books were her alternate world. When something was bad, she got a new book. If she did something good, she got a new book. Jenn McKinlay wanted to be a writer when she saw "Romancing the Stone." Kathleen Turner was a writer with that gorgeous New York apartment. But, by the time she was an adult, she had a full-time job, and writing was hard. While she was in Connecticut, she met Mary Higgins Clark. She was widowed young, left with five children. She had a full-time job as a technical writer. She was motivated. She got up at 4 a.m. to write before going to her job. Jenn wasn't willing to get up at 4 to write before going to work. Then, she moved out here in the 90s, when it was the cost-of-living was still affordable. She thought she could get a part-time job at a library, and still have time to write. 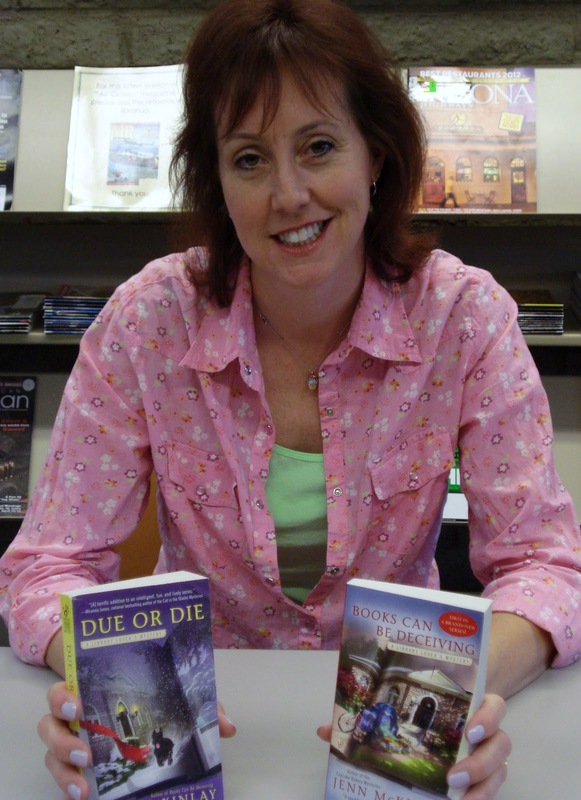 Jenn wrote two historical romances and three contemporaries. Then she met her husband and got married. She wrote a romantic comedy. She had a baby when Harlequin called, and wanted to buy the romantic comedy. That was the only good romance she wrote. It was funny, and had a mystery in it. That should have been Jenn's first clue. She wrote a couple more romances, but they were awful. Jenn writes comedy. She only writes and reads comedy. She waits for the first joke of the day. But, she doesn't think publishers know how to market romantic comedy. Harlequin killed their romantic comedy line. Jenn told her husband she really wanted to write mysteries, but she didn't think she was smart enough. Her husband is the kind of person who cuts right to the important point. He told her to write it backwards. That's how she wrote her first mystery and got an agent. That got her in. She wrote three mysteries that were not published, but it did get her the agent. Jenn's books are heavy with character and dialogue. Elmore Leonard says readers skip over chunky paragraphs of description. Mary Higgins Clark says the same thing. Don't write "She walked through the room and her skirt swished as she moved." Write "She walked." McKinlay sent her enquiries to forty agencies in order to get her first agent. Three wrote back.One was excited. One said she could work with the book. And, the third, a male, said it had fallen through the crack between his desk and the wall. Naturally, she went with the agent who was enthusiastic, and then she left the agency. Jenn used Literary Marketplace and Writer's Market to find agents. Jenn said agents will sign you if they think they can sell you. Asked about self-publishing vs. formal publishing, she said she feels as if she needs all those people raking through her materials, the agent, the editor, the copy editor. She repeated that she is contracted for eight books in the Cupcake Bakery series, six in the library mysteries, and the decoupage series is dead. Jenn was asked if she has trouble switching gears when she goes from one series to another. She said she caught herself putting the wrong names in one book, and had to search and find. Her character is Scarlet in the London Hat Shop series. She excited about that, and it reminds her of Agatha Christie. She had the idea, and then put it aside because she didn't know enough to write a British main character. But, the idea wouldn't go away. Then, she realized she could make her character an American who moves to London. So, Scarlet lived in Florida. She and a cousin in London inherit their grandmother's hat shop. Scarlet needs to leave the country after her personal life implodes and goes viral online. Her cousin tells her it's time she comes to London, and takes responsibility for her share of the hat shop. When Scarlet arrives, her cousin is missing. The final question was about the dog in McKinlay's latest Library Lover's mystery, Due or Die. She said the dog in the book is part schnauzer, part pit bull. He's based on Jenn's schnauzer, Otto. Her standard poodle had died, and her husband kept asking what kind of dog she wanted. She kept saying, I don't want another dog; I don't want a dog; I'll take a schnauzer because they make me laugh. Otto is like a toddler. He's with her constantly, and he loves her more than anything. Then, she found a pit bull in the alley outside their house, a gentle pit bull. So, the dog in Due or Die is part schnauzer, part pit bull. As usual, when Jenn McKinlay appears for Authors @ The Teague, it was a fun afternoon that covered a range of subjects. That sounds such a fun afternoon Lesa. I was interested to hear about how Jenn McKinlay writes - especially that she didn't want to have to get up at 4am to get started! I know Maeve Binchy did that in her early days, and I've always felt a bit guilty about not having that kind of determination. The comments about writing romances were also interesting, and I loved the advice about starting from the end of a mystery and writing it backwards - I can see that that might be really helpful. I just finished Due or Die and love that series. I am pretty sure I heard about it here first. Thank you, Rosemary! It's always fun to find out how authors write. See, you don't have to feel guilty at all. Every author has their own way of getting the work done. I love that series as well, Trish, and so do my sisters. But, we all worked in libraries. Someone on Facebook told me they love the cupcake series, and couldn't get into the Library Lover's series. At least Jenn writes something for everyone! Lesa, I always have such fun at the Teague. Thank you so much for hosting me and for all that you do for us authors. You're a gem! Thank you, Jenn! I was in meetings all day today, and just got back to this, and corrected a sentence where my brain got ahead of my fingers. Sorry. And, thank you, again! Such an interesting recap -thank you, Lesa! !